I'm a huge fan of trail mix and as much as I love making my own, sometimes I'm happy to buy pre-made mixes with ingredients I might not combine on my own. So when a cute container of trail mix at Whole Foods caught my eye the other day, I decided to give it a try. The trail mix I bought was made by a company called snacktrition and is called "fruit and nut mix". The mix consists of almonds, cashews, dried blueberries, dried cranberries, and some small yogurt chips. The nuts are lightly coated with calcium and the dried fruit is lightly coated in natural orange flavor giving the mix an uniquely delicious subtle salty-sweet flavor. Although dried fruit and nuts are common components of trail mix, the yogurt chips are an intriguing new addition, much healthier than the white chocolate chips I originally mistook them to be. In case you didn't know, nuts are great to integrate into your diet (in moderation) because they are full of protein (great for vegetarians) and they are believed to help lower cholesterol, provide energy, and protect people from heart disease and other ailments. Dried fruit is also great to integrate into your snacks, since it maintains all of the health benefits of eating raw fruit. A one quarter of a cup serving (which is a hearty 34 grams) of the trail mix is 150 calories, 7 grams of fat (mostly healthy fat since the mix is oven baked and not cooked in oil), as well as 3 grams of fiber -- so 3 weight watchers points. I'm constantly munching on nuts and dried fruits. Nuts are a great way to curb the appetite (opt for a TBS of almonds over pretzels). I keep a container of a homemade nut-fruit mix for my hubby and I to pick at throughout the day. Usually include walnuts and almonds, raisins and fruit juice sweetened dried cranberries,maybe just a little mango and pineapple. 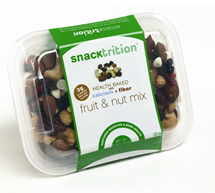 The Snacktrition nuts are really yummy and healthy. I had the pleasure of trying 4 of the 5 varieties they have and the Fiber Sea Salt Cashews are my favorite!! Great find! I'm a trail mix fan too. I like granola too - anything with a fruit/nut combo is good in my book. I love love love this mix! It is my all time favorite. I was so sad when I ran out - I need to order more! These sound exactly like the starbucks fruit and nut mix bags i usually get with my tea! they are addictively delicious, and so good for you! These are made by the same company that makes the starbucks fruit and nut mix, cashews, and almonds. You should check out SnackTrition.com for great list of products and web links to their parent company Mellace Family Brands. I had no idea they made the starbucks mix. Very cool!